In 1981, the 75th accession received by Glamorgan Record Office was a single postcard of Cardiff City Hall, c.1950s. It seems far removed in quantity from some of the other annual 75th accessions received but, as there is no size restriction on deposits, the postcard was readily accepted. The postcard formed part of a series of items which were transferred to Glamorgan Record Office from Gwynedd Archives in Caernarfon. Archive services throughout the country often re-distribute records which they receive that do not relate to the area they serve, sending them instead to the appropriate local archive. The building of the then ‘town hall’ in Cardiff was commenced in 1901 from the designs of Messrs. Lanchester Stewart & Rickards. The work was undertaken by the Cardiff building firm of E. Turner & Sons Ltd. 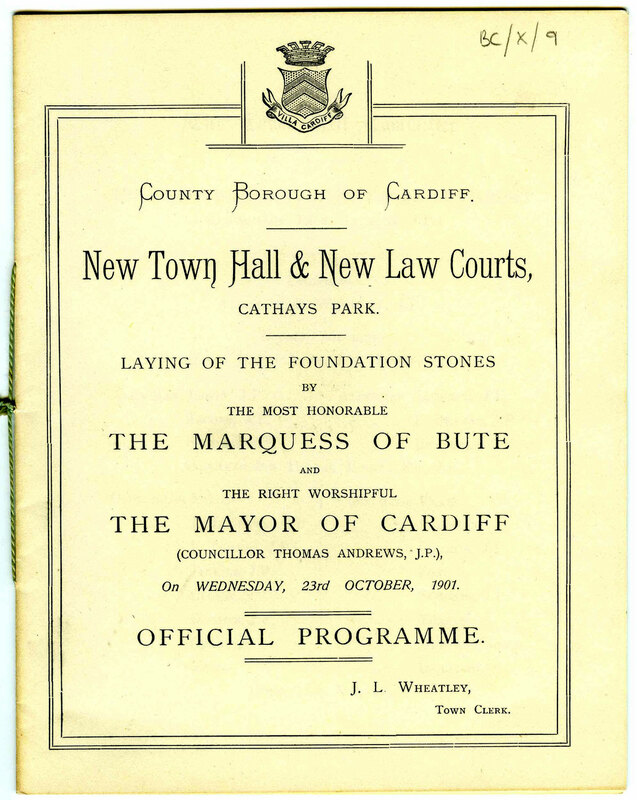 The laying of the ‘town hall’ foundation stone took place at a ceremony on 23 October 1901, and an official programme for the event is held at Glamorgan Archives (BC/X/9). 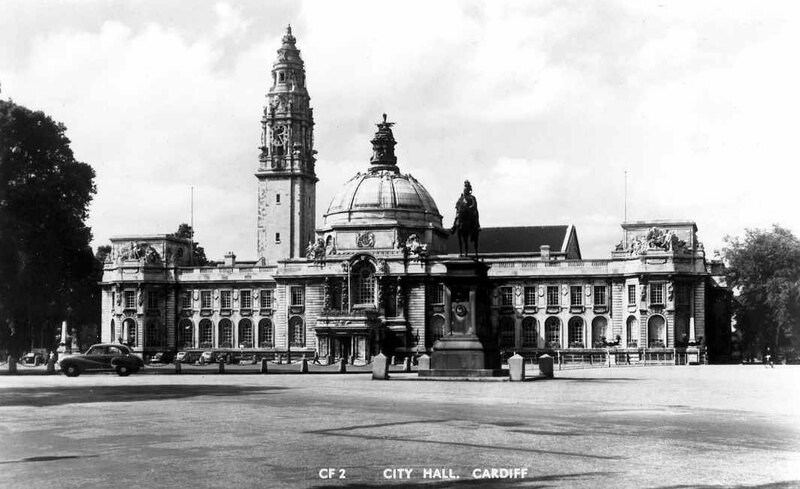 By the time the building was completed Cardiff had been given city status, and the town hall became a ‘City Hall’. A search of our on-line catalogue Canfod for records relating to ‘Cardiff City / Town Hall’ returns some 30 items. Our collection of Cardiff City building regulation plans (BC/S/1) does not include the original plans for this magnificent building. 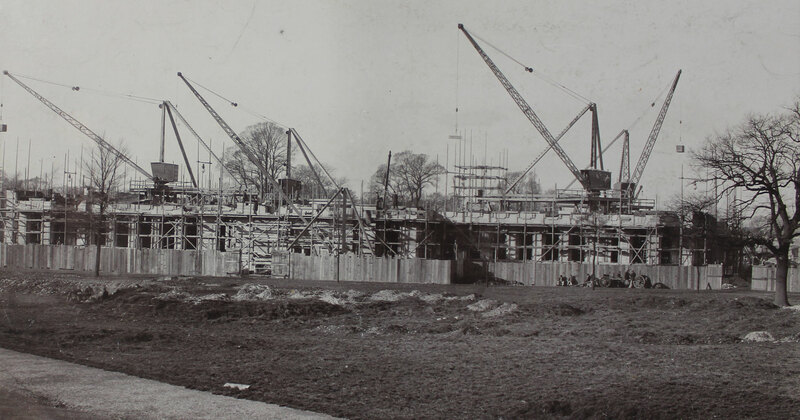 But this year we received a deposit of photographs relating to buildings constructed by E.Turner & Sons Ltd.; one has been acknowledged as showing the construction of City Hall (D1079).